Kolkata, the metro city of Eastern Part of India is situated at 22 degree 82 minute North Latitude and 88 degree 20 minute East Longitude. In 1690, Job Charnok, an agent of the East India Company chose Kolkata for a British trade settlement. Before British came to India Kolkata was a village, the capital city of Bengal was Murshidabad, around 60 miles north of Kolkata. In 1756, Siraj-ud-daullah, Nawab of Bengal, attacked the city and captured the fort. Kolkata was recaptured in 1757 by Robert Clive when the British defeated Siraj-ud-daullah on the battle field of Plassy. In 1772, Kolkata became the capital of British India, and the first Governor General Warren Hastings moved all important offices from Murshidabad to Kolkata. Till 1912, Kolkata was the capital of India, when the British moved the capital city to Delhi. Guwahati to Kolkata to Digha: We started our journey to Kolkata from Guwahati on 30th December’2011 by Air which took 55 minutes of journey. While landing at Netaji Subhash Chandra Bose International Airport we proceeded to Hotel for our halt. On 31st December, 2011 we left by train for Digha. It is 187 km from Kolkata city. Digha originally known as Beerkul during Warren Hastings time was discovered in the late 18th century by the British. It is mentioned as the "Brighton of the East" in one of Warren Hasting's letters (1780 AD) to his wife. One can view both sunrise and sunset at Digha sea beach. Digha is West Bengal's most popular sea resort and tourist spot located south west of Kolkata. The beach is girdled with casuarinas plantations along the coast enhancing the beauty of this place. These trees apart from beautifying the sands also aid in reducing the erosion on the dunes. New Year 2012 in Digha: In Digha we enjoyed New Year 2012 celebration at the hotel where we stayed conducting function by hotel management. We went to see the Digha Beach in the evening time and did shopping of local made items. The Digha market is open at low tide. Curios made of sea-shell, Shell jewellery, moderate varieties of reputed Madur of Midnapore (hand-woven mat made of weeds) in colourful designs, Cottage crafts of Digha and Midnapur are available at the beach and at other outlets in town. To bring home a keepsake, try the cottage crafts of Digha and Midnapore. Digha to Kolkata: Again we returned for Kolkata on 1st January, 2012 from Digha. In Kolkata we went to see the spots located within the city. The main attraction is the new Howrah bridge over Hoogly river and the great Banyan tree at Botanical garden. 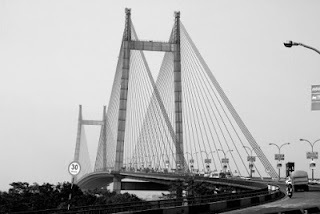 Vidyasagar Setu: Vidyasagar Setu (Bridge) also known as the Second Hooghly Bridge, is a bridge over the Hooghly River in West Bengal. 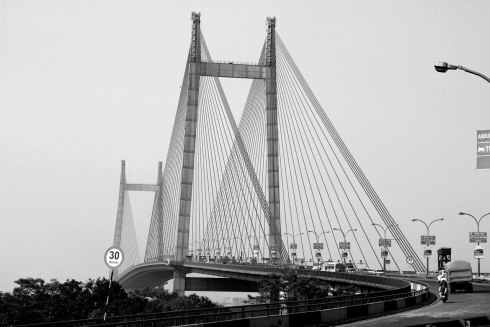 It links the city of Kolkata to Howrah. The bridge is a toll bridge for all vehicles. At a total length of 822.96 metres (2,700 ft), it is the longest cable-stayed bridge in India and one of the longest in Asia. 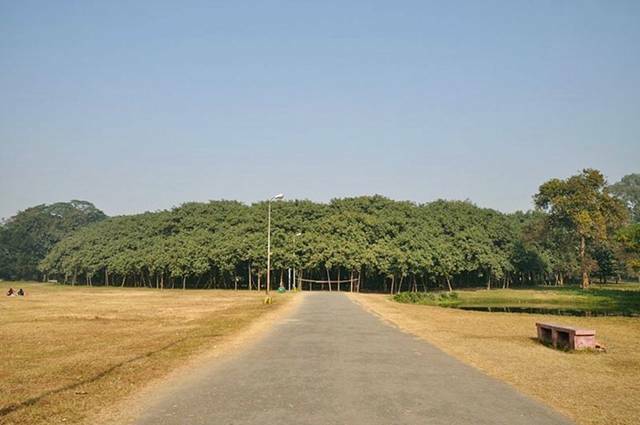 The Great Banyan Tree: The Great Banyan is a banyan tree located in Acharya Jagadish Chandra Bose Indian Botanic Garden, Howrah. It was the widest tree in the world in terms of the area of the canopy and is estimated to be about 200 to 250 years old. 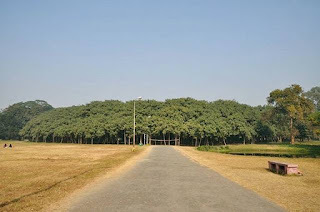 The Great Banyan looks more like a forest than an individual tree. The tree now lives without its main trunk, which decayed and was removed in 1925. The circumference of the original trunk was 1.7 m and from the ground was 15.7 m. The area occupied by the tree is about 14500 square metres (about 1.5 hectares or 4 acres). The present crown of the tree has a circumference of about 1 kilometre and the highest branch rises to about 25 m it has at present 3300 aerial roots reaching down to the ground. The electric tram in Kolkata: The Tram is the landmark of Kolkata city. The Kolkata tram is the oldest operating electric tram in Asia, running since 1902. Kolkata is the only city in India to have a tram transportation network. The first electric tram to run in Kolkata was in 1902, the first in Asia. 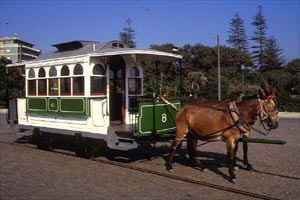 Horse-drawn trams in Kolkata: Horse and steam engine hauled trams were in service by the 1880's. The other places of interest in Kolkata are Science city, Birla Planetarium, Victoria Memorial, The Indian Museum, Zoo etc. Return to Guwahati: We concluded our journey on 2nd January, 2012 and returned back to Guwahati on 3rd January, 2012. It gives pleasure to see the British constructed bungalows and monuments of Kolkata. We ended our journey of Kolkata in the afternoon of 3rd January, 2012.